Mark your calendars. 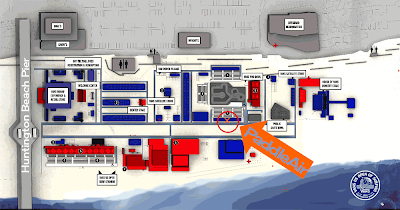 PaddleAir has a booth on the sand right in the middle of all the final action days of Vans US Open of Surfing in Huntington Beach, California on Saturday and Sunday, July 27 and 28, 2013. Stop by our newly redesigned booth on the sand (see map above) and try on a PaddleAir Ergo and experience the power and pain-free ease of paddling with a Ergo on our new land-demo surfboard. The PaddleAir team will be on hand to answer your questions, plus we have special event pricing on Ergo for all visitors. The US Open of Surfing is a nine-day event starting on July 20th and there is no admission charge for any of the events. It's free! But wait, what about parking? It's very limited near the pier. However, you can take advantage of a free shuttle service from Huntington Beach High School and Edison High School on Saturday July 27th and Sunday July 28th. Or, be adventurous and take the Metro and/or bus. Details on transportation can be found here. Check out what the ASP says about this US Open in "American Talent Set to Take On World’s Best at Vans US Open of Surfing." For more on Vans US Open visit the official website of the event. And, stop by the PaddleAir booth on Saturday and/or Sunday, July 27th and 28th.